As the first phase of Sheffield’s Heart of the City II, Grosvenor House nears completion, the next two blocks have been given the green light. Also designed by Leonard Design, Block B and Block C, known as Laycock House & Pepperpot respectively, front onto Pinstone Street at the Eastern gateway to the Sheffield Heart of the City II masterplan. 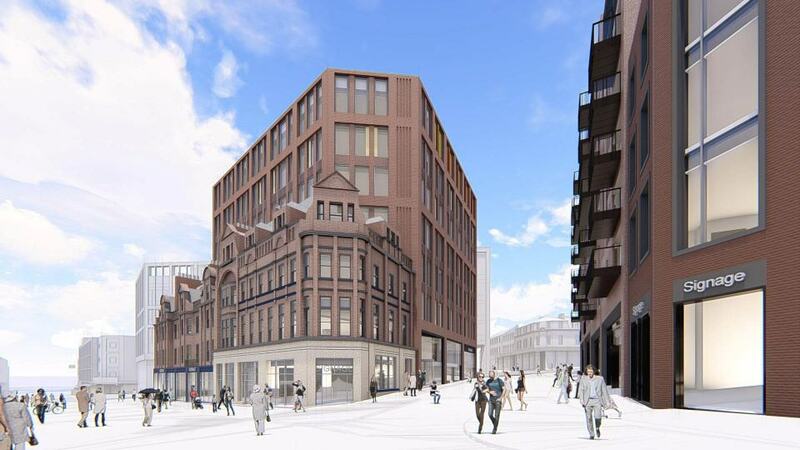 Located in such a prominent location within the City Centre Conservation Area and with the inclusion of multiple historic buildings, the design of the new blocks required careful consideration. The late Victorian Laycock House, will be sensitively restored as part of the Block B development, including the 3 storey townhouses and smaller retail units. 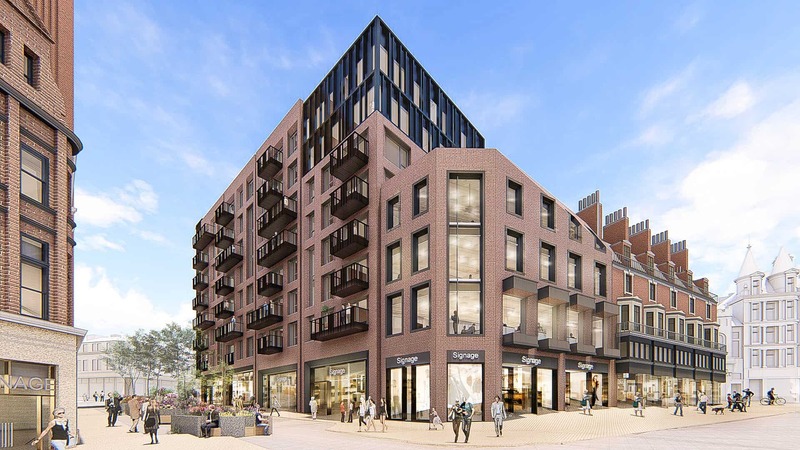 Elsewhere, Premier House will be replaced with a high quality, contemporary new-build development consisting of four new retail units and 52 apartments spread across seven floors. 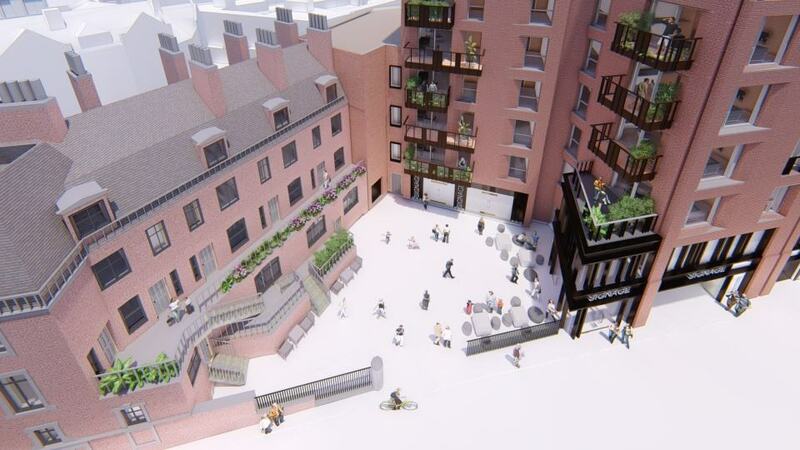 Nestled behind the shop units of Laycock House, the existing courtyard is to be re-imagined as a welcoming city garden with a ground floor café spilling out into the area. Block C incorporates the façade and roofscape of another late 19th Century building know as ‘The Pepperpot’. The existing facades facing Pinstone Street and Cambridge Street will be retained in full and restored to their former glory, with high quality shopfronts reflecting the original designs from the turn of the century. The plans include five retail units at ground level with 37,000 sq ft of premium Grade A office space on the floors above. Following a year of extensive consultation and development with Sheffield City Council, key stakeholders and the general public, the plans were submitted in November 2018 and have now been approved. A contractor to work across both Block B and Block C is set to be announced in the next few weeks and work on site is likely to start this summer, with completion scheduled for late 2020.